Boxing Day: The day the fridge is full of the remnants of parties and feasts, and everyone is too tired to cook. It’s when, unless you’re up early to shop, breakfast turns into lunch, and is likely to consist of a turkey sandwich with a side of Toblerone. 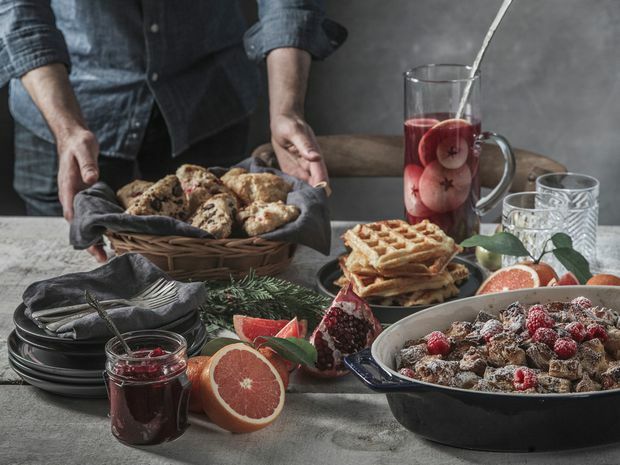 Up your leftovers game this year by gathering up the remains of your holiday meals and upcycling them into something new for brunch on Dec. 26. Re-imagining the big bird as soup and sandwiches and a simmering a pot of stock is the easy part; as for the cheese ends, fancy breads, almost-empty wine bottles, surplus cream and eggnog – well, this is where you can get creative. And even celebratory cocktails can make use of leftover fruit, cream and wine in time to clear out the fridge for a new year, which, let’s be honest, is one of the greatest gifts of all. What else can be done with excess ’nog? 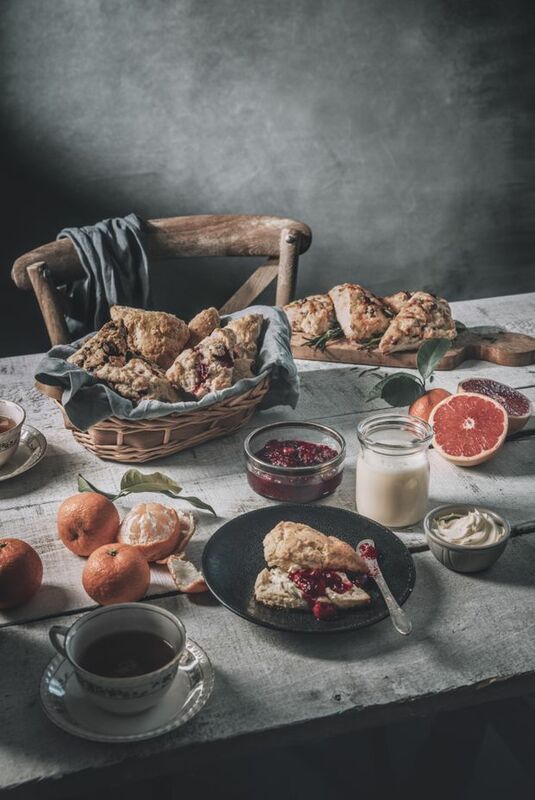 It could be churned into ice cream or warmed with gelatin and chilled as panna cotta, but it also makes a fantastic scone. Sweet and spiced, they don’t require much more adornment, but would also take care of some chopped chocolate or fresh or frozen cranberries. If you have cream to use up instead of eggnog, swap it and make them savoury, if you like, with grated cheese and/or chopped ham. In a medium bowl, stir together the flour, baking powder and salt. Add the butter and toss to combine or blend with a fork or your fingers until the mixture is coarse and crumbly. If you like, add some chopped chocolate or fresh or frozen cranberries to the mix. Add eggnog and stir just until the dough comes together. Pat into a 1-inch thick circle on a parchment lined sheet and brush the top with a little extra eggnog – I find there’s usually just enough left in the bottom of the measuring cup. Cut into 8 wedges and pull them apart on the sheet, then bake for 15-20 minutes, or until golden. Yes, waffles can be savoury, and can make use of leftover mashed potatoes, bits of baked ham and rogue cheese ends. Crunchy-garlicky-cheesy potato waffles are an ideal vehicle for leftover turkey and gravy, and a tasty base for eggs Benny. 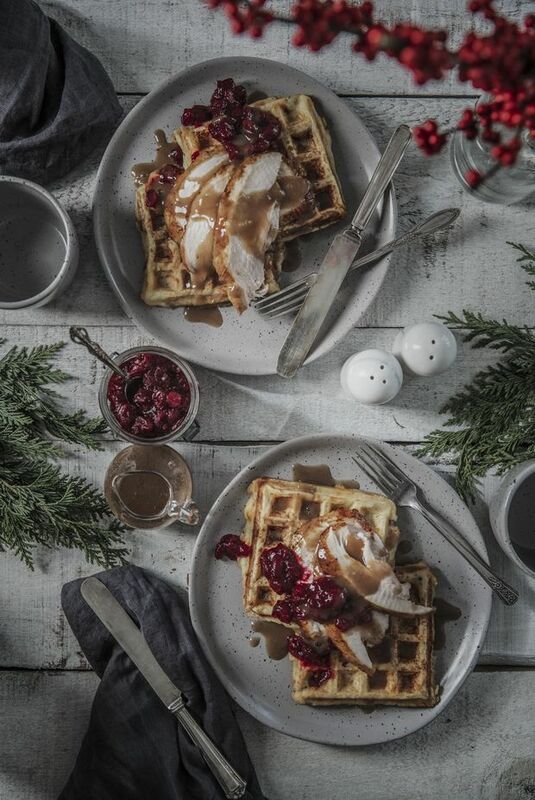 And, if you happen to wind up with leftover stuffing, you can waffle that, too. In a large bowl, combine the mashed potatoes, cheese, eggs, cream, butter, garlic, salt and pepper, stirring until well blended and smooth. Add the flour and baking powder and stir just until combined. Stir in the ham if you’re using it. Preheat your waffle iron and cook large spoonfuls of batter (about ⅓ cup) at a time according to the manufacturer’s directions, or until deep golden and crisp. Serve warm, topped with turkey and gravy or poached eggs and hollandaise. Or eat them straight up, with butter. There are always heels of fancy breads left lingering after the holidays. Fortunately, they can be resurrected in a sweet bread pudding that puffs up all warm and golden in the oven, and can be served with coffee for breakfast, or whipped cream or ice cream for dessert. Spread the panettone cubes into a shallow, buttered 9- or 10-inch round or square baking dish. In a large bowl, whisk together the eggs, milk, sugar, orange zest (if using) and vanilla. Pour over the bread and let stand for an hour, or cover and refrigerate for a few hours, or overnight. When you’re ready to bake, preheat the oven to 350 F. Bake the pudding for 45 minutes, or until puffed and golden and a knife inserted in the centre comes out clean. 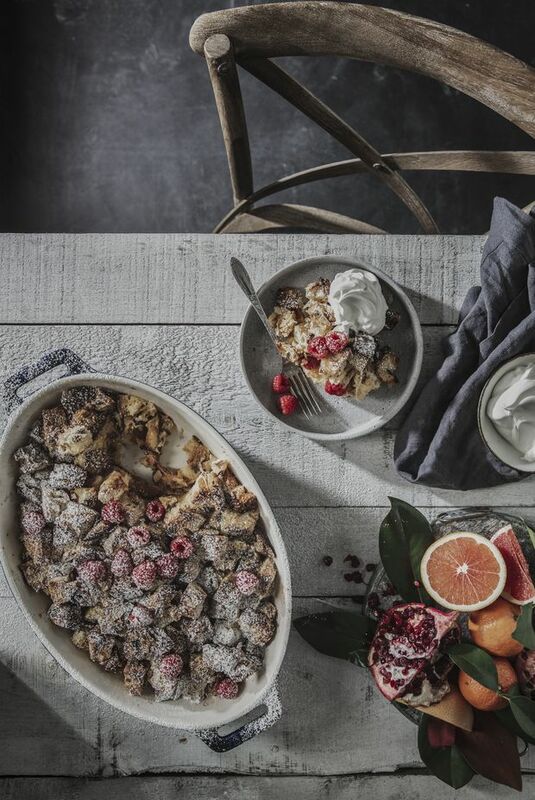 Serve warm, room temperature or cold, dusted with icing sugar. Batch cocktails make hosting a party easier, with less pressure to stock and tend to an elaborate bar. 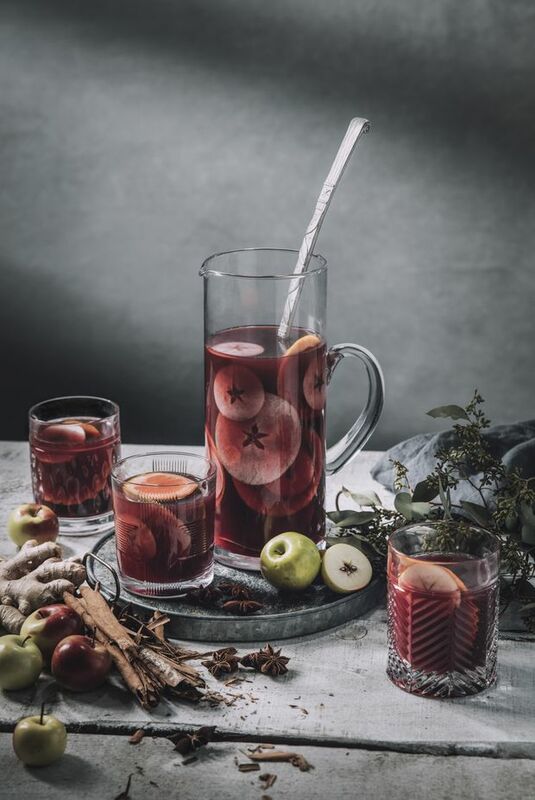 Sangria made with winter spices is brighter than warm mulled wine, and a way to use up the dregs of the bottles. Feel free to combine red, white and rosé, and even sparkling that has gone flat. In a small saucepan, combine the sugar with 1 cup water and the ginger, cinnamon sticks, star anise and rosemary. Bring to a simmer and cook for a few minutes; remove from the heat and set aside to cool. Pour the spiced syrup through a sieve into a large pitcher and add the orange juice, red wine and brandy. Add some orange and/or apple slices, and an extra sprig of rosemary if you like. Chill until you’re ready to pour.